Despite rampant scientific innovation in nineteenth-century America, traditional medicine still adhered to ancient healing methods such as induced vomiting and bleeding, blistering, and sweating patients. Facing such horrors, many patients ran with open arms to burgeoning practices promising new ways to cure their ills: Hydropaths promised cures using “healing tubs.” Franz Anton Mesmer applied magnets to a patient’s body, while Daniel David Palmer restored a man’s hearing by knocking on his vertebrae. Phrenologists emerged, claiming the topography of one’s skull could reveal the intricacies of one’s character. Bizarre as these methods may seem, many are the predecessors of today’s notions of health. 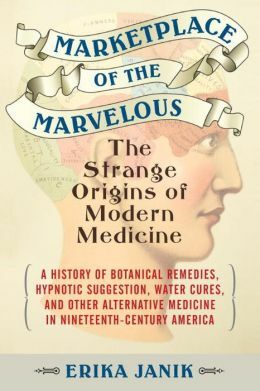 We have the nineteenth-century practice of “medical gymnastics” to thank for today’s emphasis on daily exercise, and hydropathy’s various water cures gave us the notion of showers and the mantra of “eight glasses of water a day.” These early medical “deviants,” including women who had been barred from the patriarchy of “legitimate doctoring,” raised questions and posed challenges to established ideas, and though the fads faded and many were discredited by the scientific revolution, some ideas behind the quackery are staples in today’s health industry. Janik tells the colorful stories of these “quacks,” whose shams, foils, or genuine wish to heal helped shape and influence modern medicine.